The receptor for advanced glycation end-products (RAGE) was initially characterized and named for its ability to bind to advanced glycation end-products (AGEs) that form upon the irreversible and non-enzymatic interaction between nucleophiles, such as lysine, and carbonyl compounds, such as reducing sugars. The concentrations of AGEs are known to increase in conditions such as diabetes, as well as during ageing. However, it is now widely accepted that RAGE binds with numerous ligands, many of which can be defined as pathogen-associated molecular patterns (PAMPs) or damage-associated molecular patterns (DAMPs). The interaction between RAGE and its ligands mainly results in a pro-inflammatory response, and can lead to stress events often favouring mitochondrial dysfunction or cellular senescence. Thus, RAGE should be considered as a pattern recognition receptor (PRR), similar to those that regulate innate immunity. Innate immunity itself plays a central role in inflammaging, the chronic low-grade and sterile inflammation that increases with age and is a potentially important contributory factor in ageing. Consequently, and in addition to the age-related accumulation of PAMPs and DAMPs and increases in pro-inflammatory cytokines from senescent cells and damaged cells, PRRs are therefore important in inflammaging. 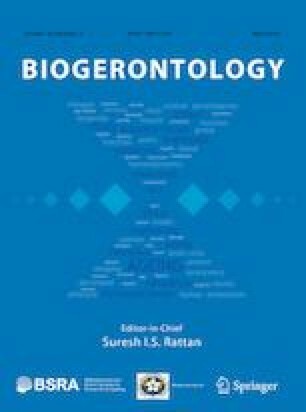 We suggest here that, through its interconnection with immunity, senescence, mitochondrial dysfunction and inflammasome activation, RAGE is a key contributor to inflammaging and that the pro-longevity effects seen upon blocking RAGE, or upon its deletion, are thus the result of reduced inflammaging. We are grateful to Mike Howsam for his contribution of editorial assistance and English proofreading. We thank LES LABORATOIRES SERVIER who have shared, under the creative commons license, some of the graphic elements that were adapted for the figures herein.